Using Epson POS printers, you avoid problems at the point-of-sale and upsetting your customers. No other manufacturer has a similar in-depth understanding of receipt printers, no other has a worldwide market share nearly as large. Jarltech is long-standing official Epson partner and today is the largest distributor in the entire German-speaking Europe. We have 2,000 POS printers of the most diverse kinds ready from stock. Even rare printer and connection types will be delivered to you the next day. It goes without saying that you receive from us original spare parts and suitable accessories, as well as consumables, e.g. receipt rolls, colour ribbons, or cables recommended by Epson. Our size is your purchasing advantage: due to our huge purchasing quantities, we can always offer Epson POS printers at best prices, no matter whether you order only one, a hundred, or a thousand units. Besides that, Epson offers you a uniquely vast selection: the range of supplied POS printers stretches from printers designed for simple applications all the way to high performance equipment for the wholesale trade, such as two-colour thermal POS printers or mobile special printers. Epson offers you the security of a prestigious big enterprise: it is not without reason that statistically, every second store in the world prints on an Epson POS printer. All in all more than 30,000 people work for the group and make an annual turnover of more than 4 billion Euros. Technical competence paired with uncompromising reliability on behalf of the Japanese manufacturer is reflected in every single detail of the POS printers. This fact is confirmed by impressively low failure rates during long-term laboratory testing, as well as by many years of practical, real-life experience. By the way: the vast majority of the printers allow subsequent replacement of the interface. That makes it possible to turn a serial printer in no time and at minimal costs for instance into a WLAN or USB printer, which once again increases the investment security for you and your clients. When it comes to purchasing POS systems, reliability and cost-effective prices are key factors for your customers. Epson, the world market leader for POS printers, is renowned for easy operation and literal resilience of their products. Cost effectiveness studies show again and again that Epson POS equipment offers almost unbeatable economic efficiency. Ensure satisfied customers with Jarltech and Epson! With more than fifteen years of experience in POS systems, Jarltech staff has seen and tested countless POS systems. Until now, no manufacturer has been able to provide a concept that is anywhere near as convincing as Epson’s. Putting much effort in research and development as well as uncompromised load tests, Epson manages to produce POS equipment that is outstanding from a technical, economical and ergonomic viewpoint. While PCs have an average life span of two years, POS systems are often used up to five years or longer. Naturally, all parts need to be powerful but durable. Unlike other manufacturers, Epson does not use standard PC components, but develops all systems on their own. Every electronic component undergoes careful selection and testing in order to ensure a long life length. Decades of experience in industrial and user electronics gave Epson the basis for important details, such as intelligent cable conduits, break proof covers, or dirt-repellent surfaces. A low total cost of ownership will impress just as well as cost-efficient low power processors and a worldwide recycling concept. 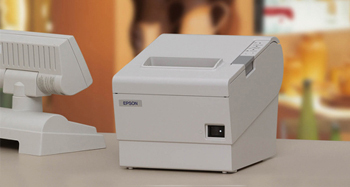 Epson POS equipment is the perfect choice, not least because of its low acquisition costs. Other remarkable advantages are a worldwide service and the availability of spare parts for at least six years from product discontinuation. Jarltech provides Epson POS equipment fast and at low prices. It does not matter if you need touch screens, restaurant cash registers, or modular POS systems: we keep all common versions ready for delivery. In other words, any system can be delivered within 24 hours in any required configuration.